I am finally getting around to posting the first four stitches of TAST 2016. Stitch number 1 for 2016 (but 24 on the total list) is interlaced cable chain. 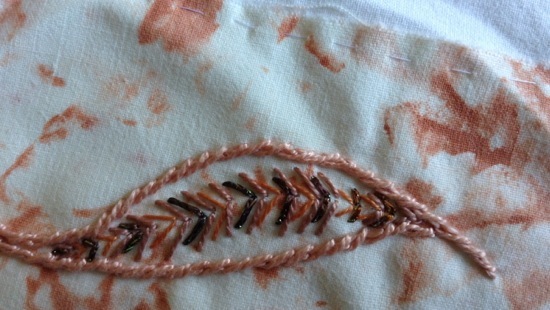 It sounds complicated but was easy to get the hang of and is a great filler stitch. I preferred the effect of lacing every stitch in one direction rather than every second stitch and then reversing to go back through again. My sampler fabric is some ‘mop up’ cotton over calico and the thread used is a variety of perle and crochet cottons. 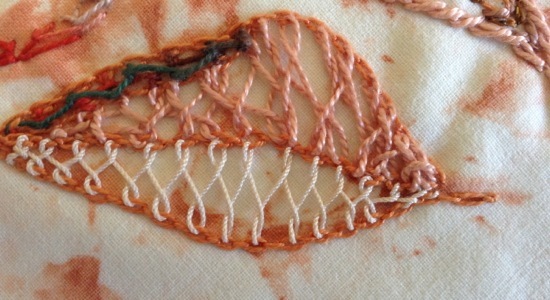 Stitch number 25 is twisted chain and makes up the edging of the next leaf. I have stitched close together (rope stitch) and I love the texture of this using Perle 5. In the centre I have used stitch number 26, Arrow stitch, using perle 8, perle 5 and a lovely metallic cord. Stitch number 27 is Bonnet stitch using perle 8. I found it difficult to get even stitching around the curves of the foot shape, hopefully this would improve with practice as I like the spiky effect. Entry filed under: Challenges, Embroidery, Hand embroidery, TAST.